How Does the Buying Process Actually Work? If you’re new to the property game then you’re probably very excited about buying your first ever place. The process of buying a property takes quite some time, however, and to newbies this can seem really confusing, stressful and even boring. If you know and understand the process, you’ll find it much easier to navigate. There are also some things you can start on before you’ve even found your dream house. You can’t approach a lender until you have all your documents, like your passport and P60, as well as payslips, tax returns and bank statements, all lined up. Find out from your bank or preferred lender what you’ll need to bring – some will want six months’ worth of bank statements and others will want longer periods. When you’ve got all your documentation, you can talk to your lender and find out how much you can actually borrow. If you don’t have a mortgage in-principle, some estate agents and vendors won’t take you seriously. Having proof of how much you can borrow is a good start and it also helps you to keep your feet on the ground when you finally start shopping. Finally – you go looking! Or, more realistically, listening to your estate agent. You’ll have your ideal home in mind, but few people end up buying this place, especially first time around. Talk to your agent and then listen to their suggestions – even if you don’t really fancy their ideas at first – because they could bag you a great place that’s just outside your dream postcode. It’s sometimes worth making an offer on a property that’s just out of reach because the vendors may want to move quickly. You make your offer to the agent, who passes it on to the vendor, who then comes back with a yay, a nay or a suggestion. This is a negotiation process, it’s just done through a third party. You’ll need to find your conveyancing solicitor before you actually need one. 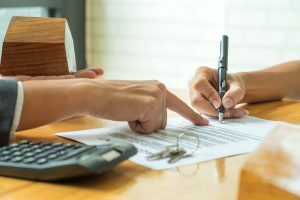 Very often, your agent will suggest one for you and then when your offer is accepted by the vendor, a memorandum of sale will be sent to all parties (including your solicitor) by your agent. Your lender will need the property to be surveyed before it can formally agree to the loan and release the funds. Most lenders want a more basic survey, but if you’re buying an older property you’ll need a more complicated and thorough one. This is for your own protection as well as the lender’s, because you could be committing yourself to an expensive purchase that also involves lots of unexpected costs down the line. You exchange contracts and then complete! Only when you exchange contracts does your offer become legally-binding. The exchange can only happen when the lender has a satisfactory survey and can approve the loan and when the solicitors have all the paperwork they need – title deeds, land searches and lease details – to draw up contracts. Once the contracts are signed they are exchanged by both parties’ solicitors and the purchase is legally-binding. Then, a completion date is set within the contract (it can’t be moved) and then the transfer of ownership from the vendor to you (completion) can happen. Once completion has taken place and your funds have moved, you can collect the keys to your new home!